According to the IMF’s just released report on global economic health, the prospects for growth have been substantively reduced and the risks particularly to the financial system have risen, all largely linked to the Eurozone’s ongoing crisis and austerity. 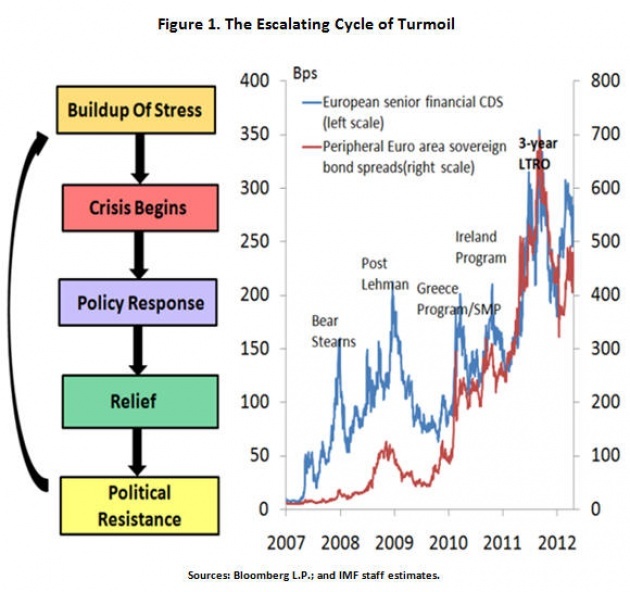 “Risks to financial stability have increased since the April 2012 Global Financial Stability Report (GFSR). Sovereign yields in southern Europe have risen sharply amid further erosion of the investor base. Elevated funding and market pressures pose risks of further cuts in peripheral euro area credit. The measures agreed at the recent European Union (EU) leaders’ summit provide significant steps to address the immediate crisis. Aside from supportive monetary and liquidity policies, the timely implementation of the recently agreed measures, together with further progress on banking and fiscal unions, must be a priority. Uncertainties about the asset quality of banks’ balance sheets must be resolved quickly, with capital injections and restructurings where needed. Growth prospects in other advanced countries and emerging markets have also weakened, leaving them less able to deal with spillovers from the euro area crisis or to address their own home-grown fiscal and financial vulnerabilities. Uncertainties on the fiscal outlook and federal debt ceiling in the United States present a latent risk to financial stability.” From IMF Report issued July 16, 2012 & Linked in Full below. Bold Policy Actions Neeed & Undertaken? 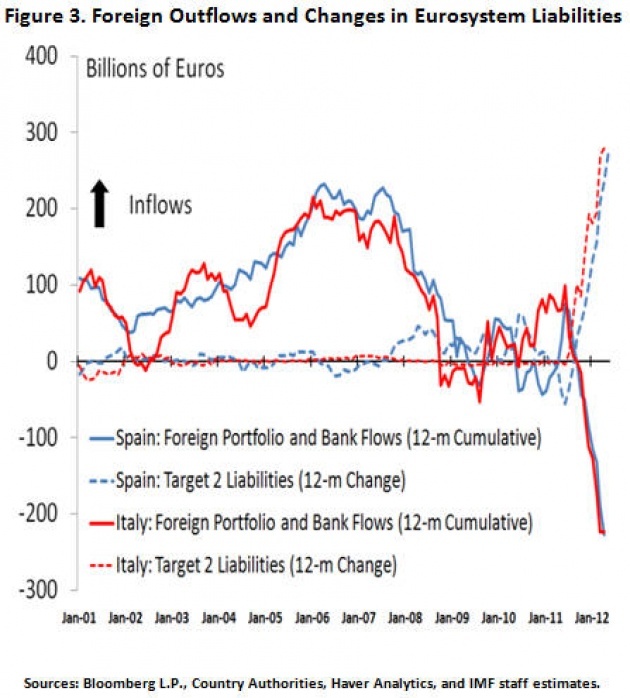 The Report gives credit to “bold policy actions at the end of 2011” by Eurozone leaders for averting greater harm. That may be in part true. However, in my opinion such response was not bold enough. In fact the rush toward austerity even then still favored by some political leaders as well as ambiguity within the IMF on wisdom/priority of such policy has had a contrary effect reversing positive effects and thus worsening the overall economic/financial health situation. In other words, I think the measures were not bold enough and perhaps contradictory negating positive applications. Read Blog for Film: "Austerity is Killing Jobs & Economic Health"
Emerging Markets Suffer even Greater Outflows & Loss of Confidence? 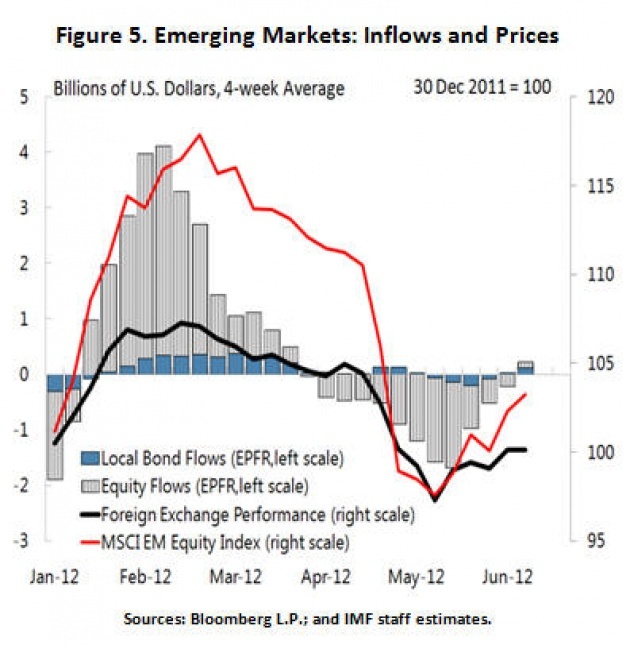 The risks for emerging markets have perhaps unexpectedly even exceeded those for the Eurozone. Emeging markets have experienced a significant capital outflow due to risk appetite reduction and/or repatriation by particularly EU financial institutions retrenching. India but others are also great example of how emerging market currencies have suffered even greater declines than the Euro. Nonetheless, some see the emerging markets as having better longer-term prospects than the Eurozone which still faces significant longer-term structural problems/risks. See our Blog for Film “Will Austerity Lead to Eurozone Losing 4.5 Million Jobs Over Next 4 Years?”.